Flax and linen merchant and manufacturer who used his wealth to support art in Dundee. After a successful career, "a succession of commercial misfortunes" led him to sell off his valuable collections to meet his debts. Douglas Terrace, Broughty Ferry, c.1856-1859. Earle House, Camperdown Street, Broughty Ferry, c.1887-1892. 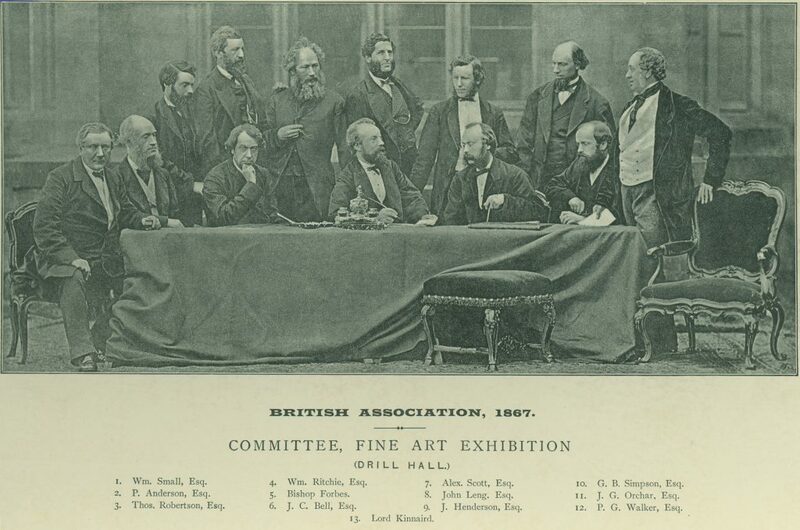 Member of the Fine Art Exhibition Committee for the British Association visit to Dundee in 1867. Numismatic Society of London. Fellow of the Society of Antiquaries of Scotland,1870. Justice of the Peace in connection with the Dundee district, c.1876-1892. Elected member and chairman, Broughty Ferry School Board, c.1873-1881. 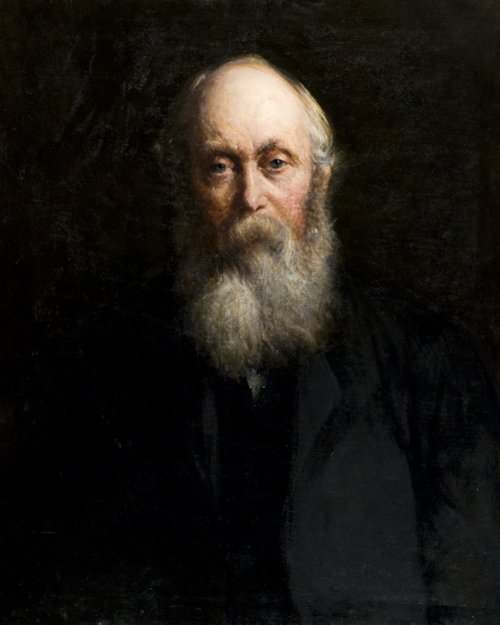 Subscriber no.28 – Bishop of Brechin – fellow member of Fine Art Exhibition Committee, 1867. Subscriber no.132 – John and W.C. Leng – John Leng was a fellow member of Fine Art Exhibition Committee, 1867. Subscriber no.190 – William Ritchie – his business partner and fellow member of Fine Art Exhibition Committee, 1867. 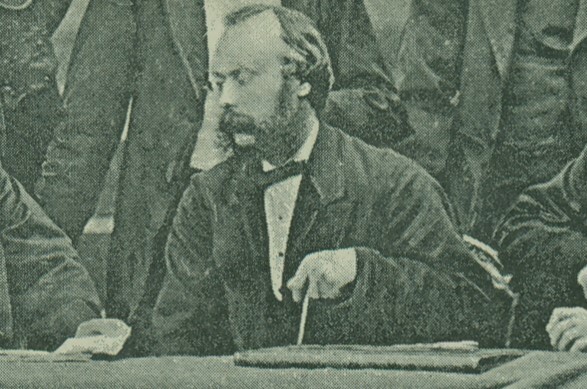 Subscriber no.260 – Lord Kinnaird – fellow member of Fine Art Exhibition Committee, 1867. He owned several mills and factories in Dundee along with his partner, William Ritchie. Office, 32 Baltic Street., Dundee, c.1856-1857. Ward Mill, possibly South Ward Road, Dundee, c.1858-1863. Ward Street Mill, Dundee, c.1858-1877. Nelson Street Factory, Dundee, c.1861-1885. Lower Pleasance Mill, Dundee, c.1871-1886. 2 Baltic Buildings, Dundee, c.1880-1886. George B. Simpson was born in Dundee. He was a partner in the firm 'Ritchie & Simpson' for about 25 years. He had been educated at Mr. Gilbert's School, Meadow Entry, Dundee, before training in manufacturing at Alexander Easson and Charles Clark's factory in the Dens. Along with William Ritchie he acquired premises in Hawkhill and a factory in the Maxwelltown area. For a short time they had an office in Baltic Street. The firm was described as merchants and manufacturers. At this time it was most likely that they were dealing with flax and linen. About 1858 the firm also acquired the Ward Street Mill, which had previously belonged to William Boyack. In addition, the firm occupied the Ward Mill which was the address both men were given in the subscription to the Albert Institute. It is difficult to establish exactly which building this was but it was probably located in South Ward Road. Ritchie and Simpson were a similar age but Ritchie was referred to as the senior partner when a social evening was held for the employees of the Ward Street Mill in the Tay Square Mission Church. Both men had a great interest in fine art. It is quite possible that they encouraged one another in amassing impressive art collections, perhaps even being a little competitive with one another. George Buchan Simpson was one of Dundee’s most notable art patrons – Matthew Jarron’s book Independent and Individualist: Art in Dundee 1867-1924, outlines how important Simpson was in developing Dundee’s art scene in the early days of the Albert Institute and beyond. Beginning as a private collector, his interest in contemporary art led him to correspond with many of Scotland’s leading artists in detail about their own and each other’s work and he even offered suggestions for compositions – something which did not go down well with everyone and put some artists off working with him. As his collections grew, Simpson lent paintings to exhibitions in various galleries. 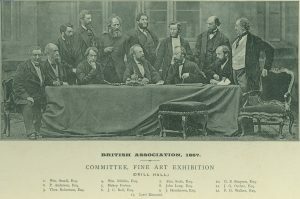 Simpson was one of the members of the 1867 British Association Meeting organisation committee – the B.A.’s visit to Dundee was an important spur for the completion of the Albert Institute. This involvement in fine art exhibitions in Dundee and beyond, in which his collection featured prominently, continued for many years. His collecting went beyond art and included “rare china, medallions, and casts, thereby forming the nucleus of what was ultimately regarded as one of the finest cabinets of the kind in Forfarshire.” As with his collection of paintings, so too with his rare literary works, covering the 15th-18th centuries, he was happy to loan them for the education and enjoyment of his fellow citizens. He was also considered to be an authority on early Scottish coinage. Simpson’s partnership with William Ritchie came to an end in 1877. Ritchie continued to operate the Ward Street Mill for a short time but withdrew from spinning and manufacturing to concentrate on being a merchant. George continued to operate as a merchant, spinner and manufacturer, retaining ownership of the Lower Pleasance Mill and the Nelson Street Factory. He had given up both works by the 1886. His fortunes did not last. Poor trade in the jute industry and some unsuccessful business ventures led to him selling off all his collections between 1880 and 1886, to pay off his debts. These included a number of Burns relics. When George Buchan Simpson died in 1892 at Leamington Terrace, Edinburgh, he was living with his family. His obituary relates that they had moved there only recently. According to his will he had no furniture or household items and had been supported by his family. Valuation Rolls for 1875-76 and 1885-86 state he had owned or tenanted property in Dundee and Edinburgh. According to his will he was being looked after by his family and his estate was valued at £4. 0s 10d. He died on his daughter Florence’s 25th birthday. Shortly before Simpson’s death, his portrait was painted by Charles Louis Mitchell and this is now in the city’s collection at the McManus. This suggests that, despite having sold his collections, he was still considered an important figure in the art world. Old Parish Records. Dundee. Birth. 18 October 1820. 282/150 37. ScotlandsPeople website. Statutory Registers. Fettercairn. Marriage. 10 June 1856. 257/6. ScotlandsPeople website . Statutory Registers. 1st District, Dundee. Birth. 1858. 282/1, p.295. ScotlandsPeople website. Statutory Registers. Monifieth. Birth. 1860. 310/91. ScotlandsPeople website. Statutory Registers. Monifieth. Birth. 1861. 310/148 p.50. ScotlandsPeople website. Statutory Registers. Monifieth. Birth. 1865. 310/83 p.28. ScotlandsPeople website. Statutory Registers. Monifieth. Birth. 1867. 310/121 p. 41. ScotlandsPeople website. Statutory Registers. Monifieth. Birth. 1869. 310/73 p. 25. ScotlandsPeople website. Statutory Registers. Monifieth. Birth. 1870. 310/184, p. 62. ScotlandsPeople website. 1861 Census Scotland. Monifieth. Roll CSSCT1861_44, line 11. Ancestry website. Statutory Registers. Newington. Death. 1 July 1892. 685/5 573. ScotlandsPeople website. Leng, John, & Co. (1893). Dundee Year Book, 1892. Dundee: John Leng & Co. Local Studies, Central Library, Dundee. Dundee Directories, 1876-1892. Local Studies, Central Library, Dundee. Dundee Directories, 1861-1885. Local Studies, Central Library, Dundee. Dundee Directories, 1871-1886. Local Studies, Central Library, Dundee. Dundee Directories, 1880-1886. Local Studies, Central Library, Dundee. Dundee Courier, 1 January 1864. British Newspaper Archive website. Edinburgh Sheriff Court Inventories, Wills and Testaments, SC70/1/353. ScotlandsPeople website. Thanks to the staff at Local Studies Central Library, Dundee and Dundee City Archives. The information above about George Buchan Simpson has been collated from a range of digital and hard copy sources. To the best of our knowledge it is correct but if you are relying on any information from our website for the purpose of your own research we would advise you to follow up the sources to your own satisfaction. If you are aware of an inaccuracy in our text please do not hesitate to notify us through our Contact page.